Hearing is the sense that helps you stay connected to your loved ones and surroundings. Not being able to hear optimally has detrimental effects on your quality of life. your hearing status and experience the benefits of hearing optimally. Why are our philosophies and values different? You don’t have to rely on a family member to bring you to your appointment; let our audiologists conduct the hearing tests in your own environment. Why are we a non-profit organisation? The Hearing Research Clinic NPC, as a non-profit, would like to minimise the costs to you and ensure that your quality of care is not compromised. of care to our clients, by abiding to evidence-based practices. Having your hearing checked should be a part of your life routine, as you would go to the dentist or have your eyes checked. It’s really simple. Start by taking our online hearing test for FREE! Or get in touch with us now. 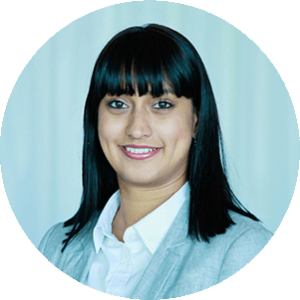 Husmita is an Audiologist with many years of experience within different areas of the audiology field, from clinical practice, training to research and development. She has extended experience over a diverse group of patients and audiologists from living and working in different countries; South Africa, Denmark and Canada. She has accumulated experience from the public, private and industry sectors of the audiology profession. She holds a Masters in Audiology degree and is currently enrolled as a PhD student at the University of Pretoria in South Africa. Her PhD research project is entitled: Strengthening the role of the audiologist in the digital age. Sound is an individual experience. Know your hearing status because living with hearing loss can be tiring and affect your ability to remember. Keeping your brain fit is important, it’s your brain that hears not your ears. Hearing is central to your health and quality of life. First prize at the University of Cape Town medical research day presentation for undergraduate research project. Most outstanding master’s research project for 2015 at the annual ENT/Audiology conference by the South African Association of Audiologists. Master’s research project was presented at the 6th Annual Coalition for Global Hearing Loss at the Gallaudet University, Washington, D.C. in 2015. Her PhD studies have received an Innovation grant from the National Research Fund (NRF) of South Africa under the emerging researcher’s program and from the University of Pretoria’s Doctoral Research Fund for the completion of her education over three years. To cover some of the operational expenses of her ambitious project, a grant from the Oticon Foundation has also been awarded. Her PhD studies are supervised together by Professor De Wet Swanepoel of the University of Pretoria and Associate Professor Ariane Laplante-Lévesque from the University of Linköping and Eriksholm Research Centre. Internationally validated and published tools will be used during the clinical encounter from The Ida Institute, Eriksholm Research Centre and many more.